As we inch closer to the end of summer and our mailboxes fill with three pound fall fashion magazines, I can't help but peek into next season's trends. 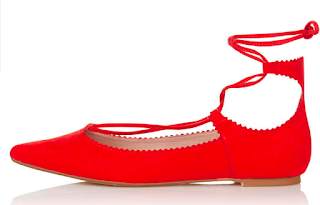 I love a trend that I know will work now and later, one of those is lace up flats. They are walkable, detailed, and perfect for summer or fall. So sleek. 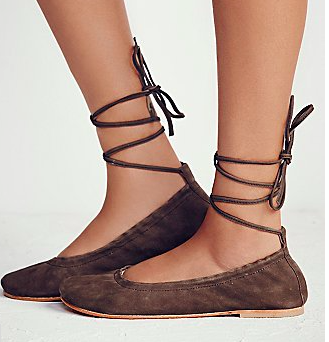 I love the mix of the espadrille lace up and the pointy toe flat. Picture these with jeans and a white tee OR a black pencil skirt. Whoa. If shoes can be girly, these fit the bill. And speaking of the bill- $45 with free shipping! Simple comfort. These flats have an earthy feel and they're going to work perfectly for fall. I love a great trend, but I love it more when I can get multiple season wears out of it! I've been so into the lace-up flats and trying to pick one!